Does your small business need an organizing overhaul? Mine definitely does. After a chaotic January I'm ready to get myself organized and rock the rest of this year! I sat down and created a 28 day calendar to get started (the dates are formatted for February 2014, but it can be used any time.) Each day has a different task or tip to help you organize and improve your business. 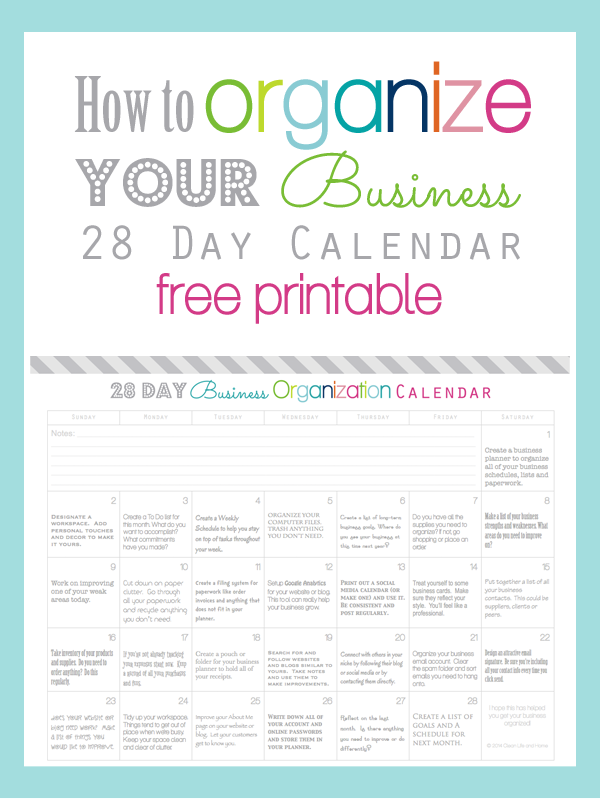 Download your FREE printable Business Organization Calendar! I included a space at the top of the page to make notes. Each day includes and task for you to accomplish. I like to cross each day off with a big, red X when I'm finished. FREE 28 Day Business Organization Calendar! 8.5"x11"
In need of a Business Planner? Click here to visit my shop. Here is some more information on my Business Planner. Do you have any business organization tips to share? The secret to having a successful business always lies on good planning. Having a good plan beforehand will help you set your goals for the business, whether short term or for the long run. Also, you could see possible problems that you might encounter before they actually happen, and plan contingencies accordingly. And it’s good to see that you’re well into it. Just keep this up and for sure, 2014 will be a good year for your business. Good luck! I belong to a group of entrepreneurs and we love your business calendar. Our group leader started a challenge so that we would follow through each day to keep our business organized. Thank you for creating this amazing calendar.